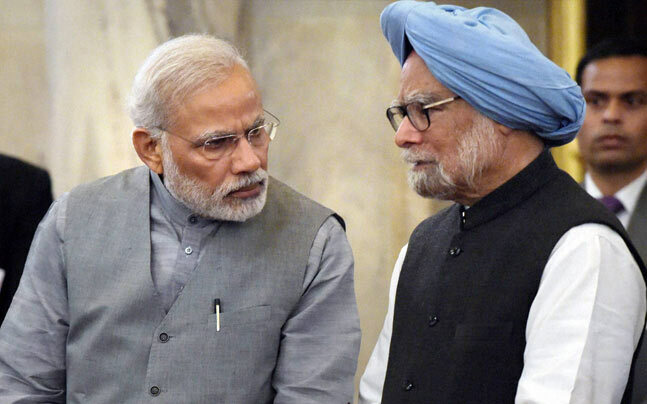 From calling Dr Manmohan Singh ‘Maun Mohan’, even as Prime Minister Narendra Modi mocked the former prime minister, he called him “Doctor Saab”. PM Modi said, ‘only Dr Saab knows the art of bathing while wearing a raincoat in the bathroom’. This is testimony to the fact that Dr Singh’s lethal criticism of Demonetisation as ‘monumental mismanagement’ had hit where it hurts the most. Modi and BJP are clearly frustrated with the outcome of the note-bandi fiasco as today’s reports suggest about one-fourth of ATMS are still dry despite all tall claims of the government. They are clearly worried about ongoing assembly elections’ result in aftermath of massive criticism of government, hence direct attack in parliament. While ModiJi misses no chance of taking credit of everything, he has preferred to maintain a studied silence of death of over 100 people. When you don’t have data to back up your claims, you resort to rhetoric and personal attacks. ModiJi, after all is a master in rhetoric, in Calcutta-ia lingo Bakhtam. What is the net gain of demonetisation and why has so much money been pumped already in the economy if as they claimed it was about cash-less economy? So neither corruption ending with demonetisation nor is it going to be cashless! Dr Singh had noted once that the history will be kinder to him than the media. As Modi repackages different schemes from NREGA to JNURM, from AADHAR to Swachh Bharat and Jan Dhan accounts started under the visionary leadership of Dr Singh, Chidambaram and company despite vociferous criticism when in opposition is another testimony to the visions they had and Hindutva leaders so lack. Yes corruption was a big issue then but it is still an issue and Modi government has not really ended it but only diverted it. So none wants to talk about VYAPAM, Reddy brothers, allegations on Gadkari, charges of misappropriation in cricket bodies under Jaitley and Anurag Thakur, etc. Finally while ModiJi is making ‘rain-coat’ jibe to suggest how Dr Singh insulated himself from taints of scams, he should not forget the thick gloves of Hindutva, ‘nation first’ and ‘Sabka Saath, Sabka Vikas’ he has put that protects him from the stains of blood from Gujarat 2002 to Mohsin Sheikh in Pune to Akhlaque in Dadri. It is also a sad commentary on the ‘collective conscience’ of our nation that gets so outraged on ‘rain coat’ but has no qualms with gloves.